Transport affects everyone—it enables access to social activities, employment, leisure, goods and services. But with traffic levels estimated to nearly double by the year 2025, there is cause for concern. Strategies to reduce the harmful effects of motor vehicles such as emission controls are welcome, but are likely to be outweighed by the projected increases in motor traffic over the next 25 years. Without a fundamental shift in policy away from the care to other forms of transport, it is inevitable that the transport sector will continue to impose large and growing costs on human health and the environment. 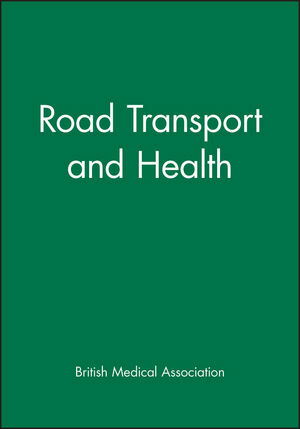 This BMA report serves to highlight the many ways in which transport policy affects health, considering not the more obvious effects such as accidents and pollution but also other consequences of transport policy such as the decline of public transport services, particularly in rural areas, the lowering of the quality of life of inner-city residents and the associated lack of physical activity leading to unhealthy lifestyles. As well as making recommendations and suggesting some possible solutions, this report aims to promote a broader debate of transport policy and health, which will highlight to the medical profession, public and government the many adverse effects that certain transport policies may have on our health and environment. This report will be of interest to all member of the public and is essential reading for students, policy makers, town planners, environmental health experts, doctors and other health care professionals. The British Medical Association is the professional association and registered trade union for doctors in the United Kingdom. The association does not regulate or certify doctors, a responsibility which lies with the General Medical Council. Patterns of transport use in Great Britain. The health benefits of road transport policy. The health impact of road transport. Reducing health risks and increasing health benefits through transport policy. Towards road transport and health.